On the 7th September the Norwich Park-&-Ride network was upgraded with a fleet of new buses and a revision to the routes operated. Established local operator Konectbus, a Go-Ahead subsidiary, took over the network completely having up to then been just one part of the operation. 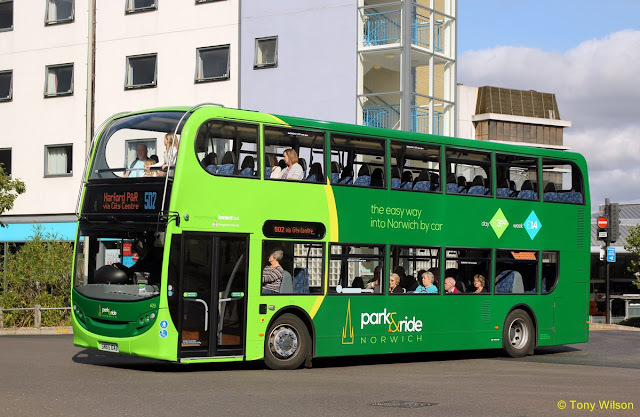 Eighteen new ADL Enviro400 diesel engined double-decks, along with several of their existing fleet buses now run the whole network. 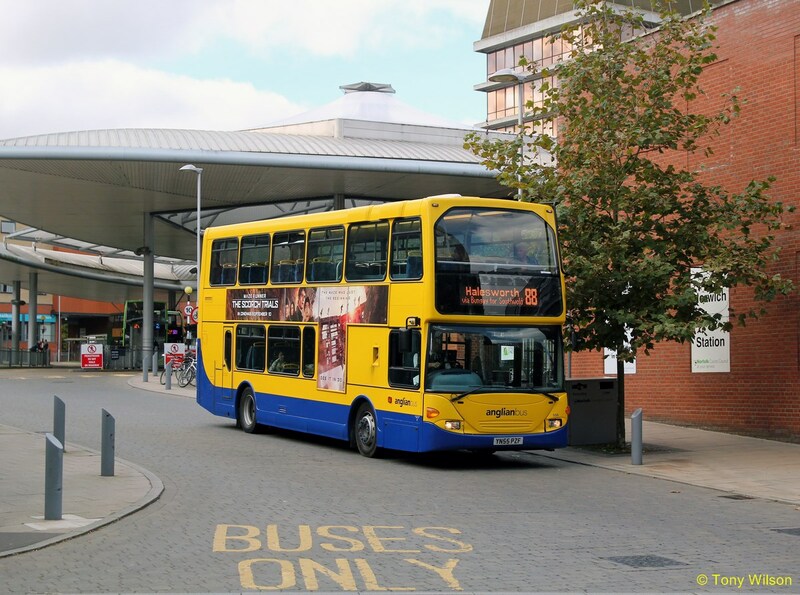 ADL double-decks 623 upper and 624 lower illustrate the 'new order' of buses that now run the lion's share of the network. 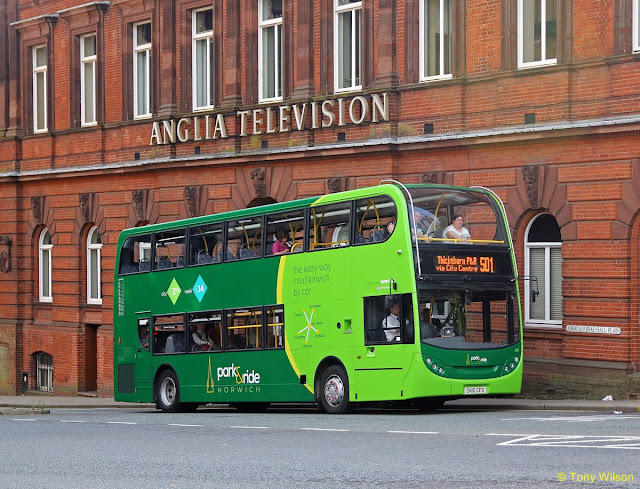 Several existing fleet buses have been retained and repainted into the new two-tone green livery number 600 upper, passes by the former Anglia Television studios, once home to such programmes as Quiz of the Week, The Price is Right hosted by Nicholas Parsons and Roald Dahl's Tales of the Unexpected, the one with the gyrating silhouetted lady. 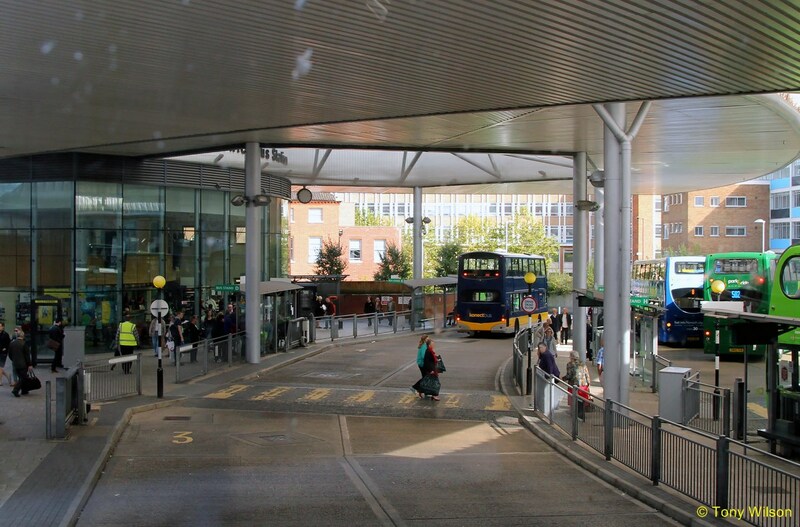 All since gone in the mists of time. Below, fleet number 800 one of the small fleet of former London operated Mercedes-Benz Citaro G articulated buses, is used on the University Hospital route and looks pretty good in the livery. 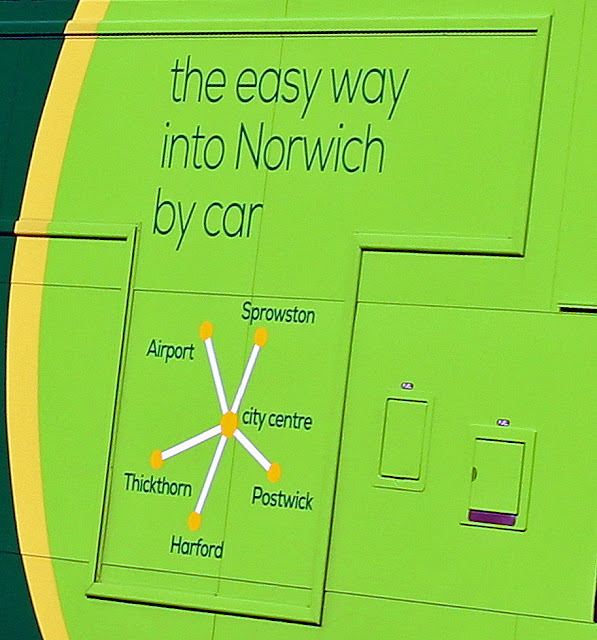 Maybe a tad better than the previous liveries carried. 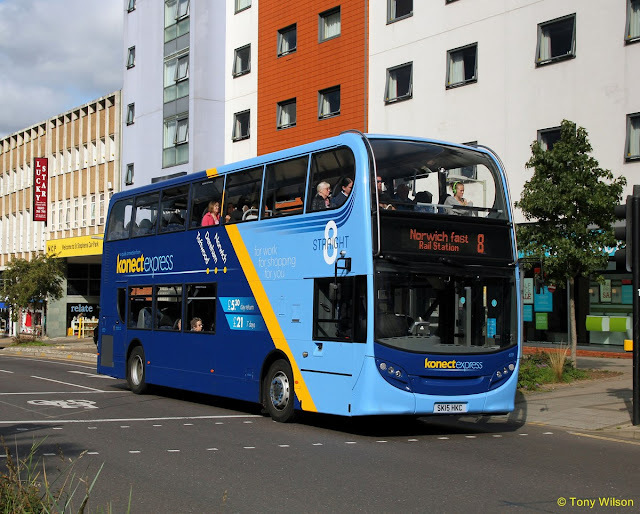 From the same date Konectbus also took over responsibility for the operation of the main Norwich city centre bus station and the facilities at the respective Park-&-Ride sites. 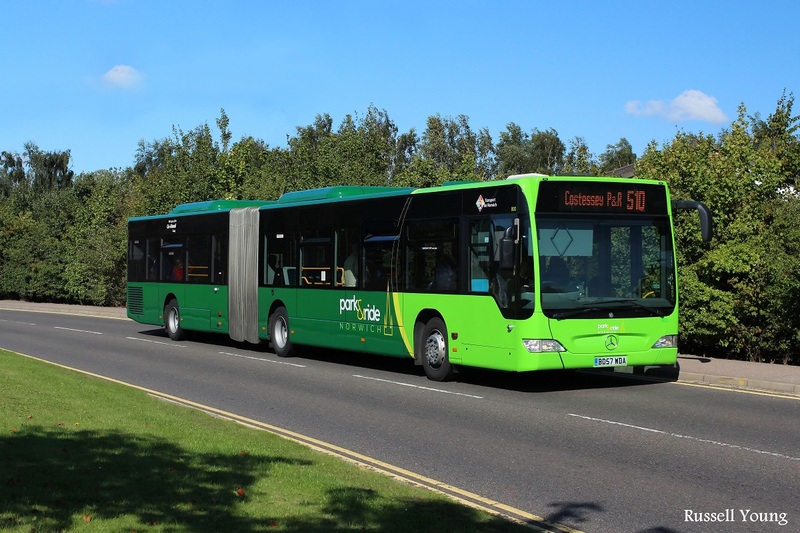 Around the same time the fleet of older ADL Enviro400 double-decks assigned to the konectexpress route 8 from Toftwood via Dereham to Norwich, were replaced by five similar new versions. 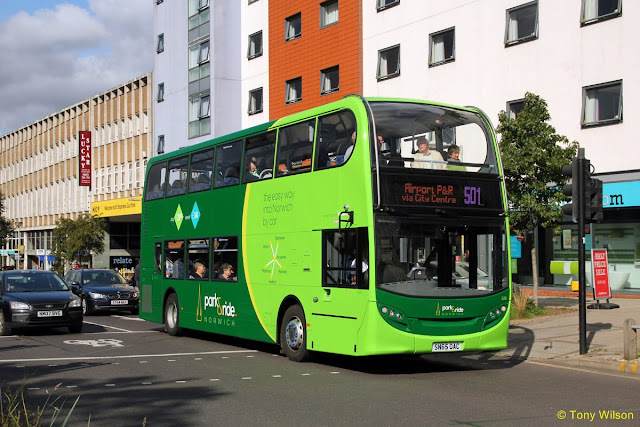 The livery as illustrated on number 619 upper, was freshened up and the route rebranded as the Straight8. The replaced double-decks were then cascaded onto the route 2/2A Norwich to Sheringham and Holt via Cromer. Number 605 below is shown as it passed along the A149 at Beeston Regis on the North Norfolk coast in the older konectexpress livery with revsed branded. 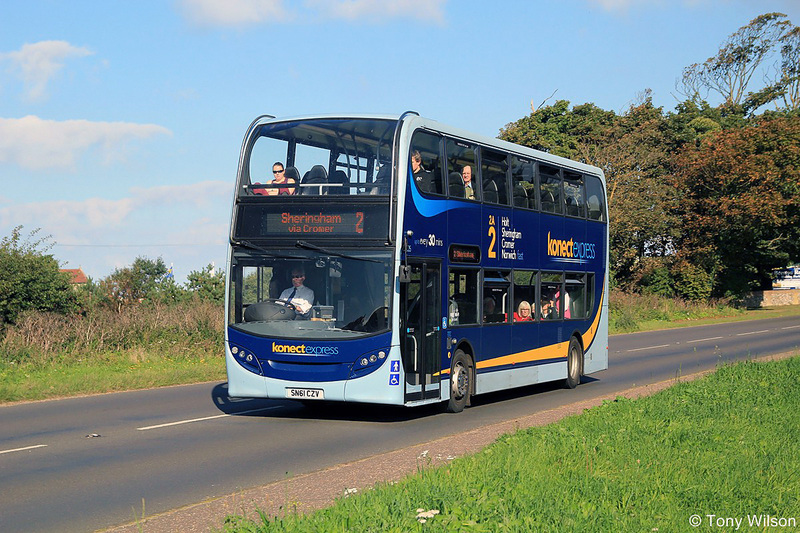 Unfortunately despite passenger and other interested parties' expressions of concern, the company has decided to withdraw this route from the 2nd November.